I did manage to pop along to church on Monday night for a brief look see of the bells out of the tower before they were taken to the foundry for attention. There were a few other ringers there including our youngest recruit who had been there since (primary) school kicking out time and had been having a whale of a time having a hands-on go at the heavy engineering, and actually got to help lower the bells from the tower. Now they are out, they look tiny to me. I have seen them a few times as I have done some basic maintenance on them in situ, including botch repairing to shrouding and fitting muffles. In their frame, when they are hard to access and you have to do a lot of clambering to get to them, they seemed much more imposing than when they sat, mute and clapperless, on sheets on the church floor. The 10cwt tenor (and the bells have handled so badly for so long it is always surprising to see the tenor is only 10cwt!) is barely waist high when removed from its person-sized wheel. As the bells were being worked on, the wheels showed just what poor condition they were in, almost collapsing as they were removed. It really was probably only months before one of them broke whilst being used. A few other things: these bells are surprisingly cracked around the rims. We were there during choir practice, and the choir was getting going on Christmas carols, which made the evening a little surreal. And the musicians were also keen to hear the bells when they were down. Whacking the 8 bells with a big spanner in sequence leaves you in no doubt at all just how out of tune they are with each other! Yesterday we rang for a service at Daybrook St Pauls for the last time for a good few months. Our tower captain’s decades of fundraising have finally paid off and the bells are due a big renovation, including some tuning work, and a new frame, lower in the tower. They have been getting steadily worse over the few years I have been ringing them, and some, in particular the 5, have something seriously wrong with them. 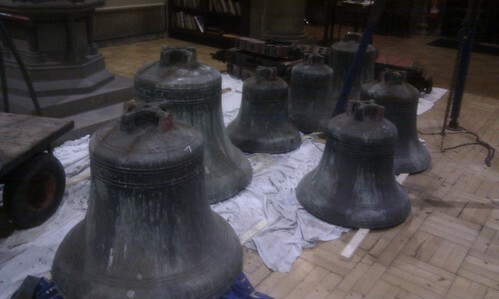 Yesterday afternoon, bellhangers were doing preparatory work and today, the bells will be lowered down the tower. Tonight from 7pm there will be an opportunity to see the bells as they will be in the nave of the church on display to the public. If you can pop along to see them you will be very welcome. Tomorrow, Frank Key Builders Merchants are very kindly loaning the use of a flat bed lorry and crane to take the bells to Loughborough where they will be serviced by Taylors. The band has been growing in recent months and there are some keen new ringers who are learning the ropes, if you will excuse the pun. Whilst our own bells are out being spruced up, we are relocating for practice nights to Basford St Leodegarious, 7.30-9pm on Friday nights. If you’d like to come along and have a go, we’d be happy to see you. The bells are due back just before Christmas, although that is a slightly ambitious time frame and it may take a little longer than that.